As we brace for the 2018 NFL Draft later this month, we’re reviewing last year’s rookies position by position and assessing their 2018 fantasy outlooks. I’ve already taken a look at some second-year quarterbacks and running backs. Now let’s turn the discussion to wide receivers. Smith-Schuster finished as the top rookie performer at the position last season and it wasn’t even close. He reeled in 58 of his 77 targets for 917 yards and seven touchdowns while earning the highest WR grade by a rookie in the PFF era. The Steeler led all wide receivers with an impressive 11.9 yards per target mark while posting an average depth of target for 10.4, helping Pittsburgh force the issue downfield. Considering that he just turned 21 in November, there is still plenty of room for growth. Smith-Schuster offers loads of dynasty potential and should be viewed as a back-end WR2 with some upside for the 2018 campaign. The Rams’ offense turned things around in a hurry in the first season under Sean McVay and Kupp was a big factor in that success. Running 58 percent of his routes from the slot, he averaged a nice 2.02 yards per route run. Kupp dropped seven of his 69 catchable balls, which raises some concern. He finished with 62 receptions (90 targets) for 869 yards and five touchdowns. The depth chart is crowded at wide receiver and after seeing the price the team paid for Brandin Cooks, you have to wonder where Kupp will fall in the pecking order for targets in 2018. Still, he offered the 2017 production he offered with Sammy Watkins in the fold. 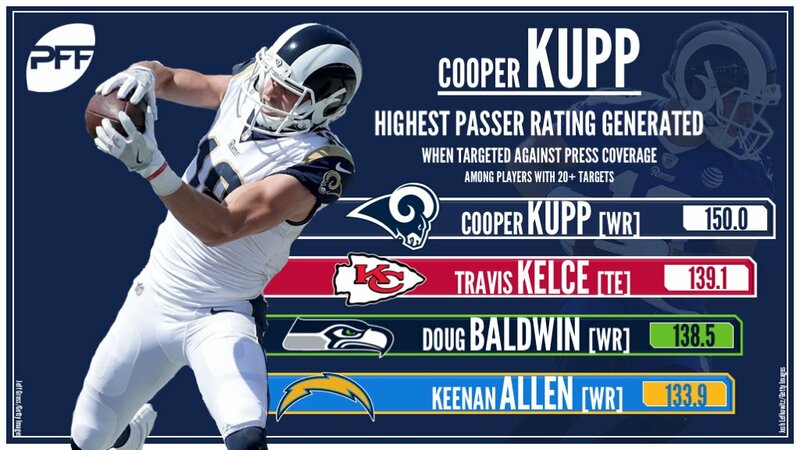 Cooks doesn’t help matters, but Kupp will have a role. The fifth overall pick in last year’s draft did not deliver for the Titans or fantasy owners that invested a mid-round pick on him in 2017. He played in just 11 games, catching 34 of his 64 targets for 375 yards (5.9 YPT). Davis struggled running his routes, as evidenced by the dismal 51.2 passer rating Marcus Mariota posted when targeting the rookie. New offensive coordinator Matt LaFleur is expected to simplify the routes and that will help. After failing to score in the regular season, Davis hit paydirt twice in the playoff loss to the Patriots. He’s a nice 2018 breakout candidate. The Westbrook hype train got rolling fast last preseason when he posted a couple big performances, but things were derailed quickly when he missed nine games with a core muscle injury to open up his pro career. When he finally got healthy, Westbrook was able to produce for fantasy owners, as he reached double-digit PPR fantasy points in four of five contests Weeks 11-16, finishing as WR29 during that span. However, the Jaguars are a run-first team and the depth chart is crowded even with the departures of Allen Robinson and Allen Hurns this offseason. He’s best suited to be a bye-week filler. Eleven catches for 95 yards was all that Williams was able to muster during his rookie year in Los Angeles. He dealt with a herniated disc for the first few months of the season and wound up buried behind Keenan Allen, Tyrell Williams and others in the Chargers’ passing attack. However, the team has too much invested not to give him a hard look in his second season. His current ADP of 14.03 offers great value given his pedigree. Godwin might be the most underrated wide receiver in this draft class. The third-round pick pulled in 34 of his 54 targets for 525 yards and a touchdown during his first season with the Bucs and appears to be in line for a larger role in 2018. His big-play ability is evident by impressive 15.4-yard average depth of target and 9.7 yards per target. Godwin has late-round appeal in redraft leagues and is on the rise in dynasty formats. There were some positive flashes made by Jones last year, but 2017 was also riddled by injuries for the Bills’ wideout. He only caught 27 of his 65 targets and finished with 316 yards and two touchdowns. Jones figures to be the WR2 in Buffalo in 2018 opposite of Kelvin Benjamin which should lead into a steady uptick in targets. He may also benefit from the departure of Tyrod Taylor. He’s worth holding onto as a long-term investment and a player to watch this summer. 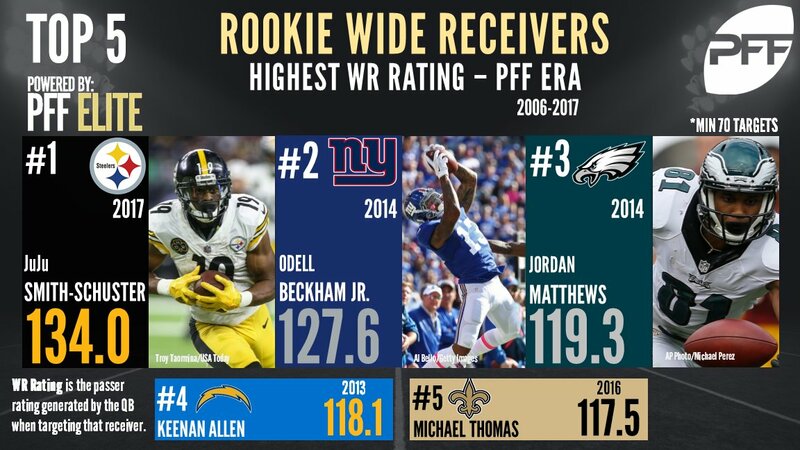 Which of these second-year WR’s will be the biggest fantasy asset in 2018? Golladay doesn’t offer the value of others in the group given the results of the above poll and his current 13.02 ADP. A few highlight-reel performances helped lift his status a bit. Over 41 percent of his fantasy points as a rookie came in Week 1 and Week 17. His 17.0 yards per reception ranked fifth among wideouts with 15 receptions or more. He’ll be a DFS dandy on some Sundays, but there’s too much competition for targets in Detroit to count on him on a weekly basis. The Panthers invested highly in Samuel in last year’s draft but didn’t quite figure out how to best incorporate the dual-threat weapon into their offense. Samuel failed to score a single touchdown in nine games and finished the year with just 19 offensive touches. Carolina will definitely look to get him more involved in 2018, but he’s as a big of a late-round dart throw as any receiver on this list. Like so many of the other wide receivers from the class of 2017, Ross endured a lost rookie season. The Bengals reached for him at No. 9 overall last April and it backfired when he sustained myriad injuries. He rushed for 12 yards but failed to have a catch and was targeted just twice in three games. Marvin Lewis has already gone on the record this offseason in support of Ross and if healthy he could supplant Brandon LaFell to be the team’s No. 2 wideout. He has much to prove though before being considered in redraft leagues.